This year's winner of our annual chili cook off is Noah's Ark Buffalo Venison Chili! New to the Chili Cook Off? 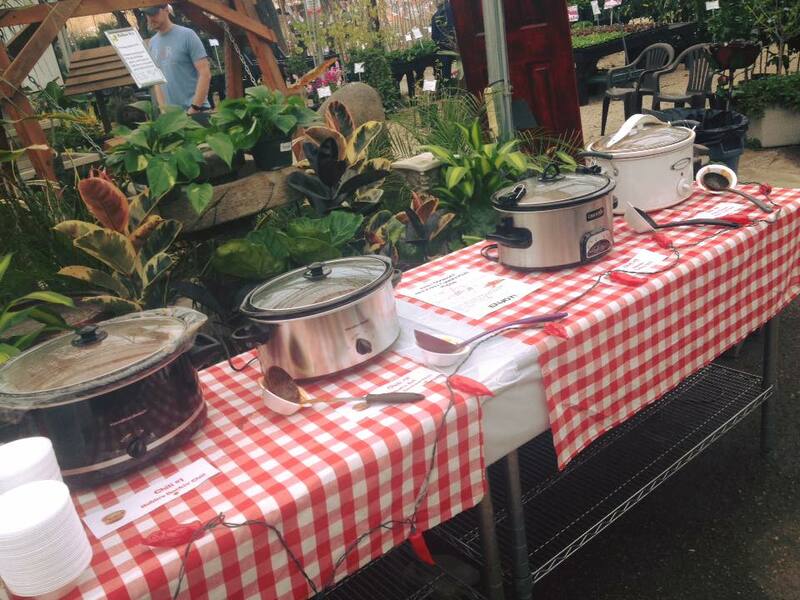 Every year The Garden Center staff competes with their best chili recipes for bragging rights. It was a tough competition this time between Robin's Rockin' Chili, Noah's Ark Buffalo Venison Chili, Mambo Turkey Chili and Wile E. Coyote West Texas Chili. We also had Mediterranean music by Gypsy Caravan, pet adoption with San Antonio Pets Alive and a rose seminar with the San Antonio Rose Society. We like to throw a little party to get ready for the coming spring season. Check out our events calendar to see what else is coming up. If you didn't make it this time, you can still try out the winning recipe below! Makes a TON of chili! Use 2 medium/large slow cookers or 1 really huge pot. Be prepared to feed a whole bunch of people, or just reduce the recipe by half! Heat the oven to 400º and put the red bell and pasilla peppers (whole) on a cookie sheet with a little olive oil. Bake for 20 minutes, flip them over then another 2o minutes. They are ready when they are charred and soft. While the peppers are roasting, brown the buffalo, venison and beef in a skillet. Add the onion and garlic; cook until soft. Add the oregano and parsley and cook for a few minutes more. Put the meat mixture in the slow cooker and add tomatoes, tomato sauce, chicken bouillon, apple cider vinegar, sugar and Worcestershire sauce. When the peppers are done, chop them up and add them to the slow cooker. Put the cornstarch in a glass with a little bit of water and mix with a fork to get a creamy consistency. Add the remaining ingredients. Let the chili cook 6-8 hours on low or about 4 hours on high or simmer in a pot for several hours. Enjoy! Oh Artemisia , how do we love thee? Let us count the ways. 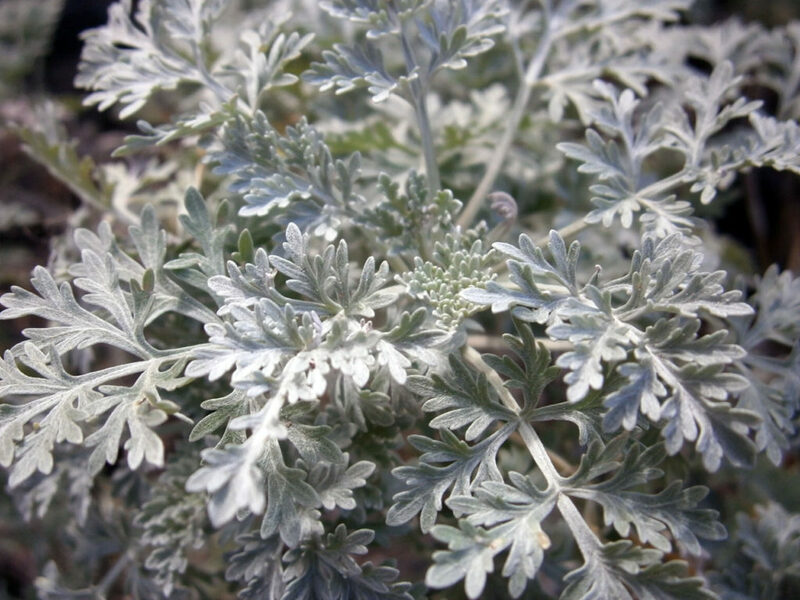 Artemisia is a silvery, aromatic evergreen perennial grown for its ornamental, culinary and medicinal properties. Run your hands through it and you'll experience its signature scent. While it might not be the most romantic plant we carry, it's easy going, yet tough and will surprise you in many ways! This perennial is easily identified by its striking gray, feathery foliage. It almost looks like the top of a carrot. Although it does make small yellow flowers, they are not very showy. Actually, clipping them off will encourage better foliage growth. Pruning regularly will keep them nice and compact. There are several different varieties of Artemesia. It's also known as Wormwood, Mugwort and Sagebrush. If it reminds you of Dusty Miller, it's because they're related! Some of the most popular varieties are Powis Castle, Silver Mound or Silver King. Most varieties will grow 1-3 feet tall and wide. Give Artemisia a sunny spot to grow with well drained soil. In fact, it hates wet soil. It's very heat and drought tolerant, thriving in the middle of summer when others start to give up. They will also grow in partial shade, although they will probably get a little leggy from trying to reach the sun! Artemisia has very few pest problems when taken care of properly. In fact, those who raise chickens like it because the aromatic foliage makes a pretty good insect repellent for the birds! For the same reason, it's also not appealing to deer. YASSS! It has cullinary and medicinal properties for us humans. Different varieties are better for different things. Check out this article if you want to learn more about that. And always do your homework before ingesting anything! Artemisia is versatile and looks great in containers, rock gardens or in the landscape. Plant it as a border or mix it with shrubs like Loropetalum or Nandina. Put it in your moon garden, white or gray garden, alongside pastel flowering plants or against the bright green of mints or grasses. It's color and texture can really break up a plain ol' flower bed. With all of its great qualities, why not give this one a chance? Here at The Garden Center, we have a few on hand and will continue to carry them in the coming spring season. Make Artemisia your gardening Valentine this year!